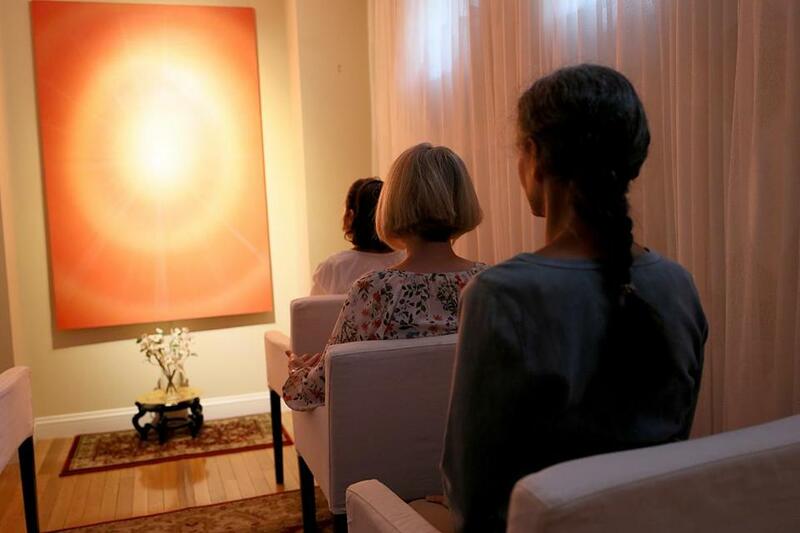 From left, Suriphan Ratanamatmongkol, Kate MacDonald, and Diane Medeiros meditated at the Inner Space Meditation Center. That eclectic approach to spirituality might have been branded as eccentric in earlier generations of older Americans, but is now increasingly mainstream. Millions of boomers are happily writing their own scripts on matters of faith, experimenting, changing religions, and incorporating diverse traditions into their own beliefs. In an era of religious fluidity, they are bringing open minds to a time of life when many reassess what’s important. Findings from a Pew Research Center survey in 2015 show that 40 percent of boomers have switched faiths. But shifting religious affiliations don’t tell the whole story of this restless cohort. Many are exploring spiritual life outside of organized religion, or sampling from a variety of traditions. While only 38 percent attend services weekly, more than six in 10 say they pray at least once a day, according to Pew, compared to fewer than four in 10 younger millennials. Forty-five percent of boomers say they meditate at least once a week. In all, nearly 60 percent say religion is very important in their lives, the Pew survey found. But their notions of religion may look very different from those of past generations. Lester Strong, 69, a former news anchor for WHDH-TV in Boston, grew up in a Pennsylvania coal town as the son of a Baptist church deacon. He began exploring Eastern philosophies as a young man. Now as he nears his eighth decade, he thinks of himself as a spiritual seeker. He has created a program at New York’s Union Theological Seminary to help boomers contemplate love, fear, purpose, and death. 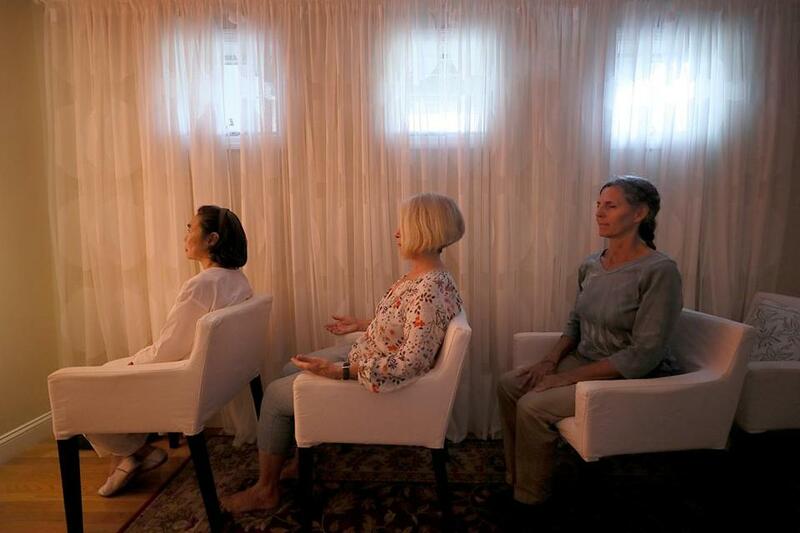 Baby boomers meditated at the Inner Space Meditation Center. Grazing at the spiritual smorgasbord, for many boomers, is part of reevaluating what’s important to them as they age. Those who have recently retired are grappling with a new life with fewer deadlines and demands, and contracting networks of associates. Time becomes more precious, and the question of how to use it becomes more pressing. The late Swedish sociologist Lars Tornstam, who began surveying older people in the 1980s, coined the term “gerotranscendence” to describe how aging affects spiritual life. He found that, as they get older, many people become less materialistic and more connected to others. They reflect on their ties to generations past and future. Choices are particularly important to a generation that came of age during the religious flux of the 1960s and ’70s. The era was marked by the liberal reforms of the Roman Catholic Church in Vatican II, the spread of Eastern religions in the West, and the advent of a politically active evangelical Christian movement. Many who emerged from that era have stuck with their religious origins but channeled some of their spiritual energies into volunteerism or social justice activism. “Going to church is part of the experience, but it’s not the whole experience,” said the Rev. Peter Gyves, 66, a Jesuit priest who moved from California to Boston in 2016 to run an ecumenical program that fights poverty, racism, and homelessness. Yet the ranks of the “spiritual but not religious” have also grown nationally, especially in the secular precincts of Massachusetts where church scandals and the mixing of religion with politics have driven many away. As part of a generation suspect of institutions, from businesses to government, many boomers have turned a skeptical eye on organized religion. But while some have left the churches or synagogues of their youth, others have returned after long hiatuses. They can recall growing up in communities with strong civic organizations, and some now seek to reconnect with that sense of community as traditional touchstones like fraternal clubs and bowling leagues have faded. “If you grew up in a world where neighbors still knew each other, a congregation is one place you can still find that,” said Campbell of Notre Dame. Malden resident Nancy Kassabian, 72, was brought up in the Armenian Orthodox church but was less involved during the years when she was immersed in her job as a teacher and assistant school superintendent. Now retired, Kassabian said her faith has deepened and she has become more active. She found herself profoundly moved by the 100th anniversary of the Armenian genocide of 1915, when the Ottoman Turks exterminated large numbers of Armenians. Rabbi Moshe Waldoks, 69, senior rabbi at Temple Beth Zion in Brookline, said the ritual of attending religious services or observing Shabbat, the Jewish sabbath, can be like a “booster shot” to older people. Waldoks, while firmly planted in the Jewish tradition, also sees great value in blending in elements of Buddhist wisdom and practice, including meditation. The rabbi, who jokingly refers to himself as a “JuBu,” said the aim is to focus on being, not doing. Focusing on others has also become paramount for Bob Weber, 72, a retired psychology professor at Harvard Medical School, who sees aging as part of his spiritual path. These days, with his busy professional life faded into the background, he said he derives as much spiritual sustenance from simply taking his dog for a walk in the morning and greeting people of all backgrounds along the way as he does from attending Mass.